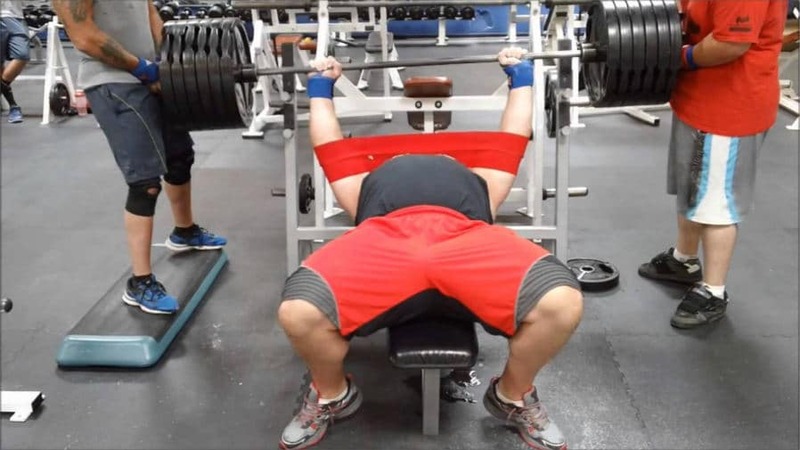 There are various techniques and methods to employ when you hit a plateau in your bench press. Switching styles from mid grip to wide grip to close grip, incorporating paused reps, benching from pins, using heavy eccentrics, and switching to the dumbbell press to name just a few. Yet, in recent years, there’s been an explosion in one particular device that’s been helping lifters bust through seemingly unbreakable plateaus: the slingshot. The slingshot bench press essentially allows for you to overload your chest and tricep muscles by aiding in the bottom portion of the lift. The slingshot is a wide band with holes on either side to slide onto your arm which then stretches across your chest and ribcage to create an increased elastic response at the bottom of the lift. This means you can use more weight to focus on your lockout without fatiguing your chest or injuring your shoulders. It also differs from doing partial reps or racked reps as your chest still receives a stimulus at the bottom of the lift. The product was created by successful powerlifter, Mark Bell, but there are now a range of copycat products available on the market. Though, Bell’s Sling Shot is the original and most widely recommended. When first using the sling shot, always use a lower weight than you want to in order to get into the groove. It’s easy to lose control of the weight due to the increased power and speed you’ll gain. In a similar fashion to cheat reps and eccentric reps, the bench press also gets you used to handling higher loads. Straight is as much a mental game as a physical one. If your mind is not used to handling a certain weight, then you’re far less likely to be able to do it. The slingshot gets you used to handling certain loads so that when you’re strong enough, you’re more confident without it. As well as this, the increased volume with heavy loads means that your tendons and ligaments are forced to adapt. Injuries are one of the biggest hindrances when trying to get stronger as it means you can’t train. A common form of injury is damage to the tendons and ligaments through too much focus and intensity on the muscle with poor recovery. As well as your mind, the slingshot allows for your tendons and ligaments to adapt to the stimulus before it’s fully placed upon them ‘raw’. How much does the Slingshot help? A study published in February 2017 in the Journal of Strength and Conditioning Research aimed to examine the influence of the Slingshot on the bench press and how much it helps. The researchers took fifteen male powerlifters aged between 21 and 33 with a mean bench press one rep max of 140kg and looked at the Slingshot’s influence on their performance, muscle activity, and barbell velocity in both maximal and submaximal lifts. Each lifter improved upon their one rep max by at least 17kg (37lbs) with some even adding 24kg (53lbs) while using the Slingshot. The individuals also moved the bar faster through the most intense point of the lift as well as their ‘sticking’ point. Muscular activity in the triceps was found to be lower at all points in the lift, but the velocity of the barbell also remained stable in the last reps of all sets. This means that the triceps will take longer to fatigue, allowing for increased volume in the workout. The slingshot is a fantastic piece of equipment for improving your bench press and upper body strength. Whether you’re looking for strength or size, the research and anecdotal evidence seems to suggest that it’s an incredibly useful tool for those who are interested in taking their training further. It can even be used as a learning tool to allow you to handle higher weights or even ‘grease the groove’ of the bench press to teach you to become more explosive and gain a stronger lock out at the top. Whether you’re recovering from an injury, chasing bigger muscles, or trying to ramp your strength up to the next level, the slingshot can make for a great addition to your training. Have you ever tried the Slingshot? Influence of the “Slingshot” bench press training aid on bench press kinematics and neuromuscular activity in competitive powerlifters. I’m old school. You want to build up strength on your bench press then do paused reps and also resistance bands for chest. Also do OHP and dips. Yes, It’s a good option as well.